SMIDGE OF THIS: We Are Ready. Today is our due date. We might be going a little crazy though. I'm feeling a little bit like a watched pot. We are also brewing cups of coffee without mugs, apparently. After that video above, I cleaned up and brewed another cup for him (he was on a conference call). But not before I texted him the video and wrote a little note. Come on Baby R, your parents are going crazy without you here! Sending you, Ian, Drake, and Baby R big love, a safe & easy L&D, and all the happiness in the world once she's here!!! Excited for you and your expanding fam!! Oh, so cute! Sending lots of well wishes your way as you wait these last moments for your little girl's arrival! How exciting! So happy for you guys! How funny! Y'all must be going crazy with excitement over getting to meet little girl soon! Sending lots of prayers and best wishes your way! The same process that got her IN there will also help get her OUT of there, *winkwink*. Prayers for a safe delivery! If we don't hear from you soon, good luck and can't wait to see pictures of the little one!! That video was too much!! HAHA! Hopefully baby girl makes an appearance real soon. I'm sure you both are incredibly ready and antsy. Best wishes! Good luck mama! I gave birth about 4 months ago, and little miss came one week and 1 day early and while we definitely weren't prepared (we thought she would be a late baby since it's my first), she was ready to meet the world, and has been a joy in our lives since. I ended up having to upgrade because my photos went from 100 to 1700 (I just can't stand to delete the photos of her). 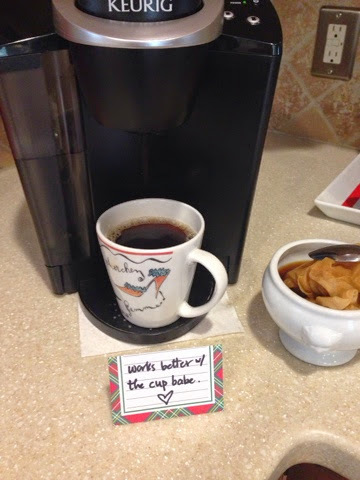 Haha I did the same thing with our Keurig the other day! Glad to know it's not just me :) GOOD LUCK mama!!! Happy Mother's Day!!! Good luck in these last few days!!! !